Using Project Web Database, you can manage and track multiple projects of your company and track resources used on each project like users, attachment & time spend etc. 2. Click More option from Site actions, select Project web database from it. 3. When the Create button is clicked a Project web database is created. 4. 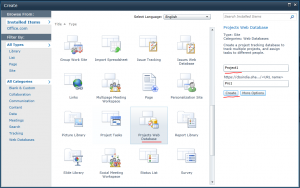 To create a new project Click on Open projects tab and then click on New Project. 5. Enter Project details like project name, customer, start date etc. and press Save & New to create another project or Save & Close to close the project creation window. 6. When Creating the Project the Customer Field will be empty to populate customer field we must create the Customers, so that click on Customers tab. 7. 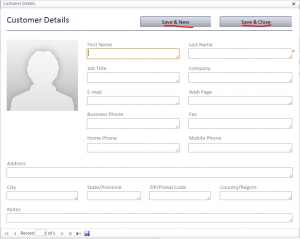 We can add details such as First Name, Last Name, Job Title, Company etc., about the company details. After editing click on Save & New to save and create new Customer or Save & Close to close the creation window. 9. 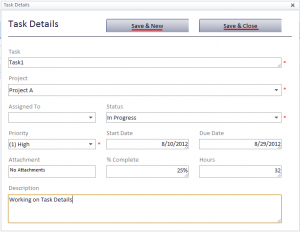 We can assign tasks to others and track them, to create task click on Tasks. 10. 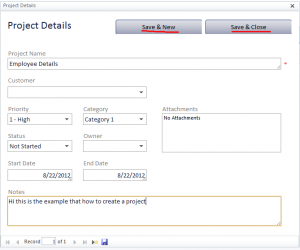 Select a project from drop down and click on New Task to assign tasks. 11. Fill the required fields and Save the form. In Task we can track the employees working on the project. The Project Web Database is like a separate application built in SharePoint where you can manage projects, customers, users etc. We’ll continue exploring more details about Project Web Database in our next article.